Refreshing and crunchy fennel is combined with sweet and sour grapefruit and tender baby arugula. Topped with a lemon and olive oil dressing and salty Parmesan cheese. Cut the stems from the fennel bulb and discard (or keep fronds for garnish). Very thinly slice the fennel bulb with a mandolin. Peel and segment the grapefruits. Make the dressing: whisk all ingredients together vigorously. 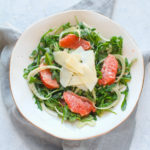 In a large bowl combine the sliced fennel, segmented grapefruit, baby arugula, Parmesan, and dressing. Toss to combine. Top with flaky salt.